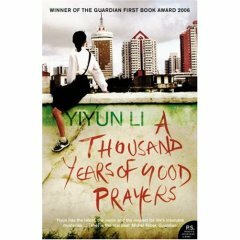 A Thousand Years of Good Prayers is a collection of ten short stories written by the Chinese author Yiyun Li. The sharp observation of human relationships, the sometimes punchy, sometimes minimalistic dialogs, as well as the warmth and empathy underneath, all make the reading very enjoyable. Yiyun Li is at her best conveying the strange sense of alienation and liberation. In the two stories I like the most, Extra and A Thousand Years of Good Prayers, the protagonists were all thrown into an unfamiliar situation. Unable to communicate with or without the language barrier, but still trying to understand, the characters at end all manage to find their way out, reaching some kind of inner peace and freedom while the outside world remains largely indifferent and incomprehensible. What strikes me most in those stories is the freedom gained by using a new language. Being able to, or being forced to use a new language, looks to have the unexpected effect of making one be freed from the inhibitory restraint of the mother tongue, instead of just providing the possibility of make yourself understandable. The author herself once said that she feels using English to write gives her the freedom to better express herself. In A Thousand Years of Good Prayers, we witness Mr Shi’s daughter’s transformation from a distant, silent figure into a vivid, laughing, animated person once she’s on the phone, speaking English. We, as Mr Shi, are astonished.